When did Thinking Fellers Union Local 282 ever find the time to record when the band has been touring the world since who knows when? I certainly don’t. 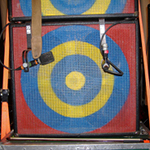 The biggest puzzle arises from the lyrics of the A-side, “Everyday.” I picture the guitarist Brian Hageman, who sings lead on the track, waking up in the morning and driving to a San Francisco high-rise office building for his important accounting position dressed in a bumblebee suit. “Well,” the front-door secretary says, “This man has been working seven years for us—since 1986, I believe—dressed every day like that. He drinks his coffee, turns in reports, and does a great job. But the funny thing is, the boss never hired the guy—he’s not even on the payroll!” Also, “Everyday” is the best ska song I’ve heard. The B-side, “Selections from A Fistful of Dollars,” is like no other, as perfect as the Fellers can get, but still matches not when they played it live. 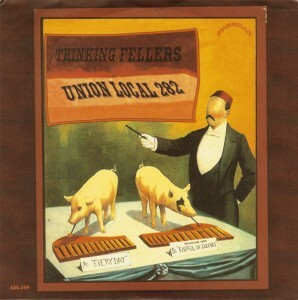 Now that Jerry’s gratefully dead, everyone should wake up and follow Thinking Fellers Union Local 282 instead.